I am so very thankful, and I know all of our family is too, for the wonderful service you offer with Look@MyBaby. A few months before our second son, Rafi, was born, his Nanny and Poppy had to move overseas. We were so heavy hearted that they wouldn’t have the opportunity to be here to meet their second grandchild. Then I received a flyer for Look@MyBaby in our St Vincent’s Private Hospital welcome pack. Needless to say I was VERY excited, and so happy I was able to let Rafi’s grandparents in Northern Ireland know he would be on live-cam 24/7 and that they could jump online and watch him anytime they liked. We also have friends overseas who were amazed and thankful for this wonderful opportunity to meet Rafi as if they were here. The service brought so much joy to our family – sharing those precious first moments with them, and other friends and family members who couldn’t be there in person. I had a lot of fun making the ‘be right back’ notes if I had to feed, change or anything else. ‘I’m out for dinner, back in 5’ type thing. 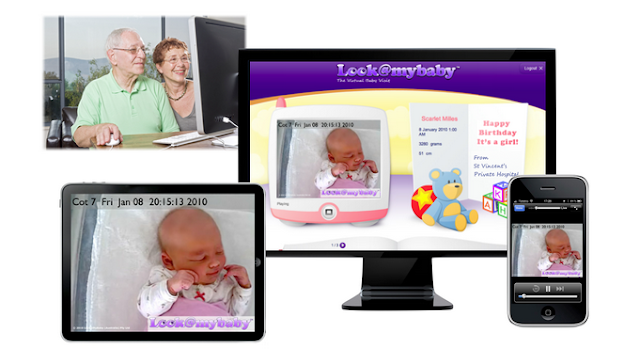 I received messages constantly from friends and family watching online via their mobile phones, who just couldn’t believe how awesome it was they could just log in from anywhere and see our little bundle. It also meant I had time to rest. This service is so easy. All I had to do was book online via the hospital website and call to activate after Rafi was born. I sent the password link via text and email to everyone we wanted to share Rafi with. It was an easy and unique way to announce Rafi’s birth. Visitors could have their new baby fix right there on their phone or computer at work, without me having to be online or manage the system. It was really nice to receive some beautiful messages online at Rafi’s crib via the Guestbook, which was sent to us in a wonderful keepsake certificate. A few weeks after coming home we received devastating news that Rafi’s Poppy in Ireland was very sick and did not know how long he had left with us. I am so grateful for the wonderful opportunity you gave us, in sharing Rafi with him and all via live streaming. Thank you so much, this has enriched our lives and made the precious experience of welcoming new life into the world that much more special. Its very informative and interesting article. Simple but very effective writing. Thanks for sharing such a nice post.